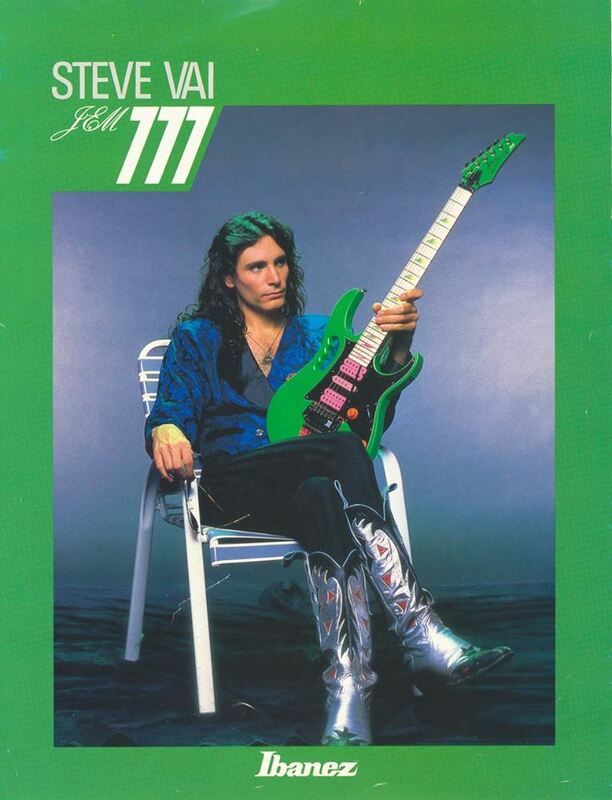 Steve Vai presents the Ibanez Jem 777 in the 1987 edition Ibanez guitar catalog. The JEM 777 variants are the oldest variants among all JEM models. Currently no 777 model is in production. There are exactly 777 JEM777LNG (which stands for “Loch Ness Green”) guitars around the world, which is also the first variant produced. One of the most noted users of these was the late Denis D’Amour of Canadian band Voivod. The Loch Ness Green guitars were also hand signed by Steve Vai. From a technical point of view, all JEM777 guitars have more or less the same specifications with the other two JEM models (JEM7 and JEM77) . All Jem777LNGs have been signed and numbered by Steve Vai, some have a handwritten graphic underneath. GreenJem.com tracks the original green jems and to date has located 156 of them.